Thomas and I are both 110% new to the parenting game so we had absolutely no clue what we were getting into. Neither of us had younger siblings nor did either of us babysit other family members. Yeah, we were well prepared. It’s really not as hard as everyone makes it out to be. We are so fortunate to be able to be home with Little M for several months straight and I fully understand this is a luxury that few people can afford. With the help of our doctor’s office, friends, family, and Dr. Google, we have been able to stumble through the first four months pretty easily. 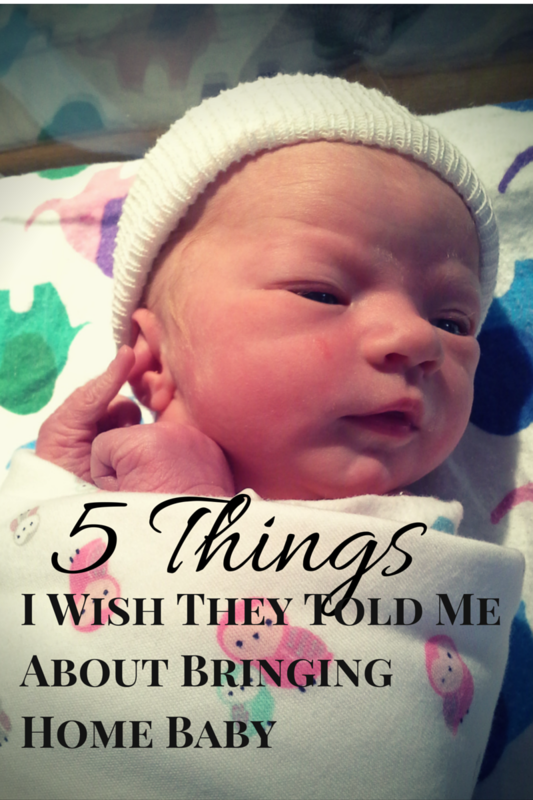 Despite that, here are my top five things I wish someone had bothered to tell me before I brought my baby home and had 1,983,562 heart attacks. While mamma was thankful for all that relaxin that was coursing through her veins during pregnancy, allowing her hips and pelvis to better accommodate baby, she was also passing some of it on to her little one via the placenta. Thanks to the relaxin and the newly formed bones and joints that babies are equipped with, loose and hypermobile joints are somewhat common with newborns and very young babies. Picking up your baby, no matter how gingerly, can often result in a shoulder or rib sliding around. It is a terrifying feeling to pick up your lovely little one and feel their shoulder move around oddly or feel their ankle pop when you’re changing a diaper! At our two week check up, our wonderfully patient pediatrician assured us this was totally normal and would subside within the next several weeks. I think it was around the time Little M was three months or so I finally felt she was not quite wet-paper-sack-fragile. This one can get pretty weird, but stick with me. Just as mom’s hormones are affecting the newborn’s joints, other hormones are affecting different parts of the body, as well. It is normal for newborns, both male and female, to develop breast buds and lactate, sometimes known as witch’s milk. The little ladies might even have a bit of bloody vaginal discharge as a result of mom’s hormones. All of this is perfectly normal and should subside within a few weeks at most. Despite how normal this is, it can still be quite shocking to see this from your little baby. While we didn’t have these issues, we actually were told about this one from our pediatrician when we brought up the joint issue. Feel free to call your pediatrician’s office if something seems amiss to you, however, or your baby develops a fever. This was, perhaps, the hardest part for me. I knew it’d be grueling. I knew it’d be dirty. But I did not know that for weeks on end there would be zero positive feedback from her beyond her simply being alive and well. And even if I did know that, I don’t think I would have been prepared for how utterly miserable it made me feel. When Madeline was hot off the press, I joked about her going through a systems testing phase. She would make random noises, her arms and legs were jerky and uncoordinated, and emotions would flash across her face for brief moments before falling asleep or crying for us. It was obvious she was getting used to her tiny body and figuring out what she had control over. It was adorable, but that was all she did. After several weeks of this, my resolve began to be tested. Soon, however, she was figuring out how to smile and giggle and those smiles made it all worth it. It was a very amazing moment when I realized she liked me! Babies have sensitive skin. Everyone knows this. What everyone doesn’t know is that newborns have ridiculous skin. Bumps, rashes, cradle cap, gooey neck and leg folds, and random splotches are all par for the course in newborns, sometimes all at the same time! I was terrified Maddie would be allergic to our cats (sorry, they were here first, sweetie…) and soon after we got her home, she began to break out in these random rashes all across her body. They would appear and then disappear within a few hours. I knew it couldn’t be allergies the way they would come and go, but it was disturbing none-the-less. After discussing this with the nurse at Little M’s two day checkup, we were assured this was normal and caused from her immune system getting started and adjusting to our world. The splotches never lasted long, and the bumps decreased as time went on. After a couple months this calmed down, but we still have issues every once in awhile with acne. Her favorite thing to do these days is to scratch her face ridiculously hard when she’s tired leaving little scratches. At around three or four months, both mothers and babies will go through a bit of a hormone change. For mom this can include hair loss (the most shocking for me), change in menstrual cycle, and swings in milk production if she is still lactating. For baby this can be increased hair growth, hair loss, fussiness, sleep regression, and a variety of other symptoms. I’m not so convinced of the hormones being the cause of the issues for baby as I am for mom, because holy wow I was not ready for that hormone swing at about three months along. Little M, on the other hand, seems to be cruising right along with normal baby problems. She sure is getting cuter by the day, though. This list only names the top five that were the most surprising to me, but there certainly were other things that threw me off about the whole thing, but perhaps that is for a different day. Were there things that were surprising to you during your first few months home with baby that you were totally unprepared for? Let me know below in the comment section, I’d love to hear from you!